William Augustus "Dub" Jones (born December 29, 1924) is a former American football halfback who played ten seasons in the National Football League (NFL) and the old All-America Football Conference (AAFC) in the late 1940s and early 1950s, primarily for the Cleveland Browns. He shares the NFL record for touchdowns scored in a single game, with six. Jones was born into an athletic family in Louisiana and played a variety of sports, including football, at his high school in Ruston. The team won the state championship in 1941, his senior year. Jones attended Louisiana State University on a scholarship for a year before being transferred to Tulane University in New Orleans as part of a World War II-era U.S. Navy training program. He played football at Tulane for two seasons before joining the Miami Seahawks of the new AAFC in 1946. The Seahawks traded Jones at the end of the 1946 season to the AAFC's Brooklyn Dodgers, who subsequently sent him to the Browns before the 1948 season. That year, the Browns won all of their games and the AAFC championship. The team repeated as champions in 1949, but the AAFC dissolved at the end of the year and the Browns joined the NFL. A tall flanker back who was both a running and receiving threat, Jones was a key part of Browns teams that won NFL championships in 1950, 1954 and 1955. He was twice named to the Pro Bowl, the NFL's all-star game, including in 1951, when he set his touchdown record. Jones retired after the 1955 season, but returned to the Browns as an assistant coach in 1963. The Browns won the NFL championship the following year. Jones left football for good in 1968 and went back to Ruston, where he worked with one of his sons in a general contracting business. Jones is a member of the Louisiana Sports Hall of Fame and the Greater New Orleans Sports Hall of Fame. Jones was born in Arcadia, Louisiana, but moved with his mother and three brothers to nearby Ruston, Louisiana after his father died when he was three years old. He played Little League Baseball as a child and went to watch boxing matches and baseball and football games at the nearby Louisiana Tech University. Jones attended Ruston High School starting in 1938, and played football under head coach L.J. "Hoss" Garrett. He was small in stature and did not make the first team until his senior year in 1941. Ruston's Bearcats football team won its first-ever state championship that year, with Jones playing left halfback and tailback. Jones also played baseball and basketball and boxed in high school. After graduating, Jones got a scholarship to attend Louisiana State University (LSU) in Baton Rouge, where one of his brothers played football. He stayed there for a year before joining the U.S. Navy as American involvement in World War II intensified. The Navy transferred him to a V-12 training program at Tulane University in New Orleans, where he played as a halfback and a safety in 1943 and 1944. Jones carried the football for a total of 700 yards of rushing and scored four touchdowns in 1944, his junior year, and was named an All-American and an All-Southeastern Conference player by sportswriters. He trained as a fireman aboard submarines while in the Navy, and in 1945 he played football for a military team at the Naval Submarine Base New London in New London, Connecticut. Before beginning his professional career, he played in the 1946 Chicago College All-Star Game, a now-defunct annual contest between the National Football League champion and a squad of the country's best college players. Led by quarterback and future teammate Otto Graham, the college players beat the Los Angeles Rams 16–0 that year. Jones was selected by the Chicago Cardinals of the National Football League (NFL) with the second pick in the 1946 NFL Draft, but did not sign with the team as he pondered returning to LSU to finish his studies. When the Miami Seahawks of the new All-America Football Conference (AAFC) offered him a $12,000 contract, however, he accepted it and joined the team. The Seahawks won just three games in 1946, the AAFC's first season of play, and Jones was traded along with two other players to the Brooklyn Dodgers, another AAFC team, in December. The Seahawks, meanwhile, folded and were moved to Baltimore after the season because of poor attendance and shaky finances. Jones played sparingly for the Dodgers in the last three games of the 1946 season, rushing for 62 yards on 19 carries. The Dodgers traded for Jones in part to replace Glenn Dobbs – a star tailback in Brooklyn's single-wing offense – because Dobbs was suffering from injuries. Jones himself was hurt early in the 1947 season, however, when he was hit by Bill Willis of the Cleveland Browns. Injuries to his knee, hip and clavicle forced him to sit out for several weeks. He broke his hand when he returned and had to play exclusively on defense for the rest of the season. Paul Brown, the head coach of the Browns, was impressed with Jones's defensive play for Brooklyn, and traded away the rights to University of Michigan star Bob Chappuis to acquire him in June 1948. 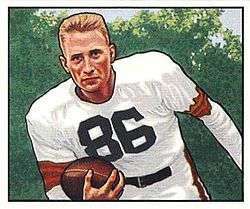 Jones began his career with the Browns as a defensive back, but was switched to halfback early in the 1948 season because his performance on defense wasn't up to Brown's standards. Jones played on offense alongside Graham, the team's quarterback, and star fullback Marion Motley as the Browns won all of their games in 1948 and beat the Buffalo Bills for their third straight AAFC championship. He ended the year with 149 rushing yards on 33 carries. Over the next two seasons, Jones developed into a star flanker, a position he helped invent. He was both a running threat and a receiver – his tall stature was well-suited to receiving – and helped complement a passing attack that featured the Browns' two main ends, Dante Lavelli and Mac Speedie. Jones often went in motion behind the line of scrimmage before the snap at a time when few players did so, causing confusion and mismatches on defense. He had 312 rushing yards and 241 receiving yards in 1949, when the Browns won another AAFC championship. Jones came into his own in the 1950 season, when the Browns joined the NFL following the dissolution of the AAFC. Cleveland won the NFL championship against the Rams that year, helped by Jones's skill receiving short passes underneath opponents' coverage. Jones had 31 receptions and 11 rushing and receiving touchdowns in 1950. Jones continued to excel in 1951, scoring 12 touchdowns and amassing a career-high 1,062 yards from scrimmage. He tied an NFL record in a November 25 game against the Chicago Bears by scoring six touchdowns in a single game, a record he shares with Ernie Nevers (1929) and Gale Sayers (1965). The Browns finished the season with an 11–1 win-loss record and advanced to the championship game, but lost this time to the Rams. Jones came in second in the NFL in touchdowns scored and was named to the Pro Bowl, the league's all-star game. He was also selected by sportswriters as a first-team All-Pro. "Dub has the speed, the guts and the know-how of a great player," Paul Brown said at the time, calling him "the most underrated player in the league." Jones made the Pro Bowl again in 1952, when he had 952 total yards and six touchdowns. Cleveland advanced to the NFL championship for the third time in a row that year, losing 17–7 to the Detroit Lions. In 1953, Jones's production declined: he had just 401 total yards and no touchdowns, and he decided to retire after the Browns reached and lost another championship game. He went back to Ruston to work at a lumber business he ran in the offseason, but Brown asked him to return in 1954, saying the team needed him. Jones played for two more years, winning two more championships with the Browns before retiring for good. He pulled his hamstring in an exhibition game before the 1955 season, an injury that caused him to miss several games and bothered him all season. Jones spent seven years working at his business in Ruston after leaving the Browns. He worked briefly as a special instructor for the Houston Oilers and an occasional advisor to college programs in Louisiana, but otherwise was out of football. He returned to the Browns as an assistant coach, however, in March 1963 after Paul Brown was fired by team owner Art Modell. Blanton Collier, Brown's long-time deputy, became head coach and put Jones in charge of the receivers. Jones and Collier had been close during his playing days, and Collier considered him an astute student of the game. Under Collier, Jones supervised the offensive backfield and the ends, but was also the Browns' offensive play-caller. He directed the team from the press box on Collier's behalf because Collier was hard of hearing and could not do so himself. The Browns won their first six games at the beginning of Jones's coaching career in the 1963 season, although a late slump cost them a spot in the championship game. The team regrouped the following year, ending with a 10–3–1 win-loss-tie record and winning the NFL's eastern division. Cleveland went on to win the championship game against the Baltimore Colts in 1964. The Browns advanced to the championship game again the following year, but lost to the Green Bay Packers. During his tenure as a coach, Jones was the primary position coach for running backs Jim Brown and Leroy Kelly, both of whom are members of the Pro Football Hall of Fame. He also coached receiver Paul Warfield, another hall of fame member who helped propel the Browns to the 1964 championship. Jones stayed with the Browns until early 1968, when he quit and was replaced by Nick Skorich. The Browns had offered him a part-time coaching job but made clear that he could not stay on as offensive coordinator; Jones declined the reduced role. After leaving the Browns, Jones moved back to Ruston and did occasional scouting for the team at the nearby Grambling State University. He was also a volunteer coach of receivers on Grambling's football team. Later in life, he worked for his son Tom's general contracting business in Ruston. Jones was inducted into the Louisiana Sports Hall of Fame in 1982 and the Greater New Orleans Sports Hall of Fame in 1984. He is the father of former NFL quarterback Bert Jones, who played 10 seasons in the 1970s and 1980s for the Baltimore Colts and Los Angeles Rams and won the NFL's most valuable player award in 1976. Jones and his wife, Schump, have seven children, including four sons who played college football. ↑ Norwood 2004, p. 23. 1 2 Norwood 2004, p. 24. 1 2 3 4 "William "Dub" Jones". Louisiana Sports Hall of Fame. Archived from the original on October 14, 2012. Retrieved October 14, 2012. ↑ Norwood 2004, pp. 24–25. 1 2 Norwood 2004, p. 25. ↑ Norwood 2004, p. 26. ↑ Norwood 2004, pp. 27–28. ↑ "Dub Jones". Allstate Sugar Bowl. Archived from the original on June 28, 2013. Retrieved June 28, 2013. ↑ "Holy Cross Beats Sub Base, 20–6". The News and Courier. Worcester, Mass. United Press International. November 5, 1945. p. 6. Retrieved December 2, 2012. ↑ King, Steve. "Jones to be honored pre-game". Cleveland Browns. Archived from the original on June 27, 2013. Retrieved June 27, 2013. 1 2 Norwood 2004, p. 30. ↑ "The 1946 College All-Star Game". Oxnard Press Courier. Associated Press. August 24, 1946. Archived from the original on June 29, 2013. Retrieved June 29, 2013. ↑ Norwood 2004, p. 29. 1 2 3 Peticca, Mike (November 10, 2012). "Cleveland Browns' 100 best all-time players: No. 59, Dub Jones". Cleveland Plain Dealer. Archived from the original on June 28, 2013. Retrieved June 28, 2013. ↑ "Bill Daley Rejoins Pool With Seahawks". The Palm Beach Post. Associated Press. December 5, 1946. p. 13. Retrieved June 28, 2013. ↑ Piascik 2007, pp. 48, 59. ↑ "1946 Miami Seahawks Statistics & Players". Pro Football Reference. Archived from the original on June 28, 2013. Retrieved June 28, 2013. ↑ "1946 Brooklyn Dodgers Statistics & Players". Pro Football Reference. Archived from the original on June 28, 2012. Retrieved June 28, 2012. 1 2 Norwood 2004, p. 31. ↑ Norwood 2004, p. 32. ↑ "Grid Dodgers Sign Chappuis, Michigan Star". St. Petersburg Times. New York. Associated Press. June 29, 1948. Retrieved June 29, 2013. 1 2 Norwood 2004, p. 33. 1 2 3 4 5 6 7 8 "Dub Jones NFL Football Statistics". Pro Football Reference. Archived from the original on June 29, 2013. Retrieved June 29, 2013. ↑ Piascik 2007, pp. 102–103. ↑ Piascik 2007, p. 103. ↑ Piascik 2007, pp. 180–181. ↑ Piascik 2007, p. 227. ↑ Piascik 2007, p. 253. ↑ Norwood 2004, p. 41. ↑ Heaton, Chuck (September 12, 1954). "Jones To Rejoin Browns Tuesday". Cleveland Plain Dealer. p. 8–C. 1 2 3 4 Norwood 2004, p. 42. ↑ Heaton, Chuck (September 4, 1955). "Graham Agrees To Join Browns". Cleveland Plain Dealer. p. 1–C. 1 2 Heaton, Chuck (August 21, 1963). "Dub Jones, Browns' Aide, Is Thinking Football Man". Cleveland Plain Dealer. p. 29. 1 2 Heaton, Chuck (April 9, 1963). "Firing of Brown Came as Shock". Cleveland Plain Dealer. p. 47. ↑ Heaton, Chuck (October 9, 1963). "Browns Take 'New Look' To New York". Cleveland Plain Dealer. p. 33. ... Dub Jones, the man who sends the plays down from upstairs. ↑ "1963 Cleveland Browns Statistics & Players". Pro Football Reference. Archived from the original on July 4, 2013. Retrieved July 4, 2013. 1 2 "1964 Cleveland Browns Statistics & Players". Pro Football Reference. Archived from the original on July 4, 2013. Retrieved July 4, 2013. ↑ "1965 Cleveland Browns Statistics & Players". Pro Football Reference. Archived from the original on July 5, 2013. Retrieved July 5, 2013. ↑ Heaton, Charles (July 18, 1966). "Dub Jones Says: Kelly, Green Can Fill Jim's Shoes". Cleveland Plain Dealer. p. 33. ↑ "Jim Brown". Pro Football Hall of Fame. Archived from the original on July 4, 2013. Retrieved July 4, 2013. ↑ "Leroy Kelly". Pro Football Hall of Fame. Archived from the original on July 4, 2013. Retrieved July 4, 2013. ↑ "Paul Warfield". Pro Football Hall of Fame. Archived from the original on July 5, 2013. Retrieved July 5, 2013. ↑ Pluto 1997, p. 196. ↑ Heaton, Chuck (January 24, 1968). "Collier Gets New 3-Year Contract". Cleveland Plain Dealer. p. 27. ↑ Lebovitz, Hal (January 25, 1968). "Hal Asks...How About Firing Me?". Cleveland Plain Dealer. p. 65. In Jones' case he actually wasn't given a pink slip. He was told he could stay on in a part-time coaching capacity, but not as chief of the Browns' offensive unit. He didn't like that arrangement so he quit and when his departure was announced yesterday he replied with some bitterness that he didn't appreciate the manner in which the news was given out. ↑ Heaton, Chuck (July 16, 1968). "Plain Talk". Cleveland Plain Dealer. p. 35. ↑ Heaton, Charles (July 26, 1968). "Grambling College Grid Glory Will Be Showcased Tuesday". Cleveland Plain Dealer. p. 3. 1 2 Passan, Rich. "Catching up with Dub Jones". Orange and Brown Report. Archived from the original on July 5, 2013. Retrieved July 5, 2013. ↑ "Greater New Orleans Sports Hall of Fame/Allstate Sugar Bowl". Allstate Sugar Bowl. Archived from the original on July 5, 2012. Retrieved July 5, 2012. ↑ Norwood 2004, pp. 44–46. ↑ Heaton, Chuck (November 15, 1978). "Bert Jones' parents can't bear to watch". Cleveland Plain Dealer. p. 1–F. It's not that Dub and Schump, his wife, don't still enjoy football. But watching the fourth of their seven children participate these days can be more agony than ecstasy. Norwood, Stephen Harlan (2004). Real Football: Conversations On America's Game. Jackson, MS: University Press of Mississippi. ISBN 978-1-57806-663-6.